Are there any options to help save on wedding catering costs? Absolutely! Food, drinks and labor fees can get very costly in a hurry. You want to make sure that your guests enjoy plenty of delicious refreshments, but you don't have to break the bank in doing so. You can save significantly on your wedding costs by making a few simple changes. You save a bundle - and your guests will be none the wiser! From food choices to beverages, you can save on wedding catering tremendously. 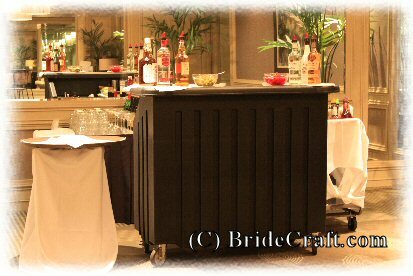 Did you know that offering a full bar at your wedding can be a huge expense? It definitely can. By setting limits, you can reduce wedding expenses and still insure that your guests get wined and dined to their expectations. 1. Choose your date to negotiate. Marry in the off season to snag a better deal from your caterer. During the slower months, caterers will lower their prices or become more open to negotiating prices in an attempt to book more business. Business is business in the off season. Use that to your advantage and get more for your dollar with your wedding catering. 2. Choose a time of day to save on wedding catering. A day time wedding is less expensive than an evening wedding. A brunch meal is more affordable than a formal dinner. An added bonus is that the bar will not be hit as heavily, as drinking a certain quantity of alcohol is normally associated with evening activities. 3. Keep a tight guest list. Inviting only the nearest and the dearest will help trim catering cost, obviously. You will be able to offer your guests certain top options that you would not otherwise have been able to afford for a larger guest list. 4. If you intend to serve hors d'oeuvres, limit your selection to just 3. It can get very costly when you offer up too many appetizers! Just be sure to make enough of the appetizers you do select to last until dinner is served. 5. 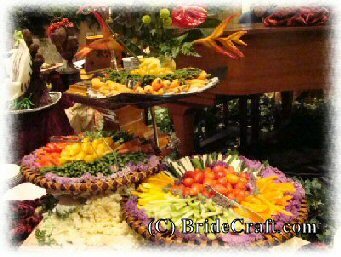 Consider having a fruit and cheese or crudite station set up at your reception. This will save on labor costs, as you won't need additional staff to butler pass the food. Fruit and cheese stations usually have an elegant layout. Some of the foods they offer include special cheeses, salami, grapes, various dip, etc. They may also have seasonal fruit and a berry trays, along with assorted crackers and bread. A pretty marvelous spread, and it can save you a pretty penny! 6. Get cookin’. If it is appropriate for your venue, you can cut catering costs by preparing the menu yourself, and have family members or close friends kick in to help cook the meal. You can hire staff to serve and clean up the meal for guests, as well as a bar service. Do the math and weigh your options to see if this would be a reasonable path for you and your fiancé to save on wedding catering. Remember that this is a huge task that could backfire on you if things come down to a time crunch. 7. Skip the expensive carving station. A meat carving station is expensive. Opt for a pasta station that boasts several delicious sauces for your guests. This station will still be a beautiful and scrumptious display, minus the killer cost. 8. Save Champagne for the toast only. Champagne is very expensive, and so is the serving staff that pours it. So reserve its use. Or, cut it out completely and substitute with sparkling cider. 9. Cut back on the bar. Serve only sodas, beer and wines. This will help to curb excess drinking, and save you a bit on the over all cost of the bar itself (which is a very expensive portion of the wedding catering). 10. Tip included. Make sure that your tax and gratuity is included before you sign anything. Tax and gratuity can be a surprise at the end of the bill if it is not tallied in. Tax will be determined by the state and county the wedding is in, and gratuity is normally 20%. 11. Don’t forget your vendors. Skipping vendor meals is NOT the way to save on wedding catering. Do not forget to feed the wedding and event professionals who are working hard to provide you with a beautiful wedding. Any vendor who is present through the meal should be provided with food. Can’t afford to feed another 9 people filet mignon? Ask for a yummy and filling alternative for your vendors to be served. And if it is just not reasonable to have your caterer feed your other vendors, arrange to have food delivered from a local diner. 12. With all your planning did you still end up with leftovers? Don’t take them home to stockpile in the fridge and eventually be thrown out. Donate them to the local soup kitchen or women’s shelter and make it a deduction when you file.. Make sure you get a receipt for the items. This goes for just about every single item in your wedding from flowers to your wedding dress. Anything leftover from your wedding you choose to donate is a tax deduction. You can save on wedding catering! There are dozens of things you can do, and still offer your guests plenty of wonderful choices for the event. When it comes to planning your wedding, every little savings adds up to big savings. Return from Save on Wedding Catering to Bride Craft Home.